With the diffusion of sensors and smart devices, and the advances in connection technologies, the Internet of Things (IoT) has become a very popular topic. Because of the creation and expansion of new and existing sensor networks, the need to define a common standard for sensors’ interfaces representation has arisen. Currently it is difficult to make different sensors and sensors’ networks interoperate seamlessly, since their interfaces are not always well specified or are not ready to be adapted immediately to one another. 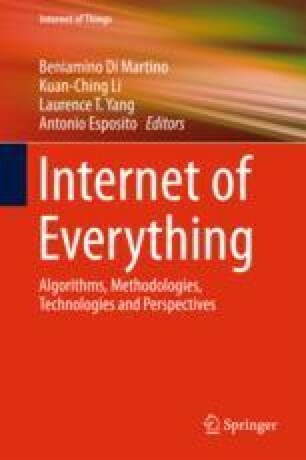 In this chapter we will introduce the main technologies currently available to define a machine readable and human comprehensible IoT API, and we will point out the several challenges which will derive from an automatic analysis and description of IoT interfaces. Security issues are also considered and discussed. API workbench. http://apiworkbench.com. Accessed 8 Feb 2017. Blueprint, A. P. I. Format 1A revision 8. https://github.com/apiaryio/api-blueprint/blob/master/API%20Blueprint%20Specification.md, 05–22. Burstein, Mark, Hobbs Jerry, Lassila Ora, Mcdermott Drew, Mcilraith Sheila, Narayanan Srini, Paolucci Massimo, Parsia Bijan, Payne Terry, Sirin Evren, Srinivasan Naveen, and Sycara Katia. 2004. OWL-s: Semantic markup for web services. http://www.w3.org/Submission/2004/SUBM-OWL-S-20041122/. Inter-iot. http://www.interiot.eu. Accessed July 2017. Iot european project initiative. http://iot-epi.eu/projects. Accessed July 2017. John Gruber. Markdown: Syntax. http://daringfireball.net/projects/markdown/syntax. Accessed 24 June 2012. Lafon, Y. 2009. Team comment on the web application description language submission. http://www.w3.org/Submission/2009/03/Comment. Accessed August 2011. RAML Workgroup.2015. Raml-restful api modeling language. http://raml.org/ 2015. Accessed 10 Feb 2017. Samsara web-Site. https://www.samsara.com/api. Accessed 8 Feb 2017. Swagger Team. 2014. Swagger restful api documentation specification 1.2. Technical report, Technical report, Wordnik. https://github.com/wordnik/swagger-spec/blob/master/versions/1.2.md. Yahoo weather API. https://developer.yahoo.com/weather/. Accessed on 8 Feb 2017.